In a small bowl combine all ingredients and mix well. Refrigerate. Combine raw mushrooms in a large bowl. Transfer mixture to roasting pan and roast in oven 20-25 minutes. Combine all ingredients a medium bowl and toss to combine. Transfer mixture to roasting pan and roast 20-25 minutes. Remove from oven and toss with 4 tablespoons Parsley Chimichurri. In a medium sauce pan combine white wine, vegetable stock and roasted mushrooms. Over medium heat simmer until liquid is reduced to 1 cup. Add butter, asparagus, lemon juice, lemon zest, salt, thyme and parsley. Heat just long enough to heat the asparagus through. Rub halibut pieces with olive oil, salt and pepper on both sides. In an oven proof medium saute pan over medium high heat add 2 tablespoons olive oil and heat until shimmering. Place halibut in pan and saute 3 minutes. Flip halibut and place pan in 375 degree F oven for 2-3 minutes. To serve place halibut in center of plate. 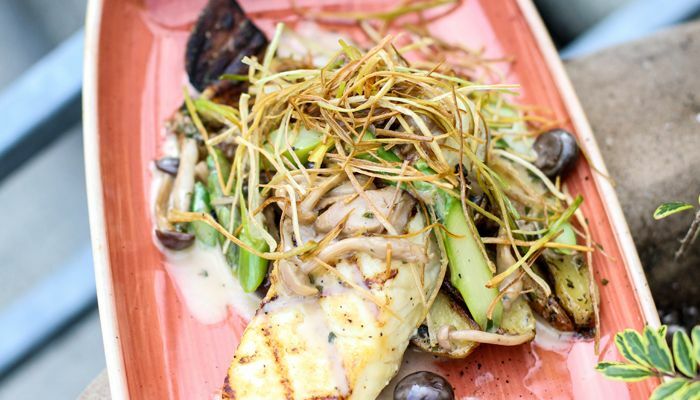 Top halibut with Forest Mushroom and Asparagus Ragout. Scoop a generous portion of Chimichurri Roasted Fingerlings alongside.